For the first Slavic literary language, see Old Church Slavonic. Church Slavonic, also known as Church Slavic, New Church Slavonic, or New Church Slavic, is the conservative Slavic liturgical language used by the Orthodox Church in Bulgaria, Russia, Belarus, Serbia, Montenegro, Bosnia and Herzegovina, North Macedonia, Ukraine, Poland, Czech Republic and Slovakia, Slovenia, and Croatia. The language appears also in the services of the American Carpatho-Russian Orthodox Diocese and occasionally in the services of the Orthodox Church in America. It was also used by the Orthodox Churches in Romanian lands until the late 17th and early 18th centuries, as well as by Roman Catholic Croats in the Early Middle Ages. It is also co-used by Greek Catholic Churches, which are under Roman communion, in Slavic countries, for example the Croatian, Slovak and Ruthenian Greek Catholics, as well as by the Roman Catholic Church (Croatian and Czech recensions, see below). In addition, Church Slavonic is used by some churches which consider themselves Orthodox but are not in communion with the Orthodox Church, such as the Macedonian Orthodox Church, the Montenegrin Orthodox Church, the Russian True Orthodox Church and others. The Russian Old Believers and the Co-Believers do also use Church Slavonic. Church Slavonic represents a later stage of Old Church Slavonic, and is the continuation of the liturgical tradition introduced by the Thessalonian brothers Cyril and Methodius in the late 9th century in Nitra, a principal town and religious and scholarly center of Great Moravia (located in present-day Slovakia). There the first Slavic translations of the Scripture and liturgy from Koine Greek were made. 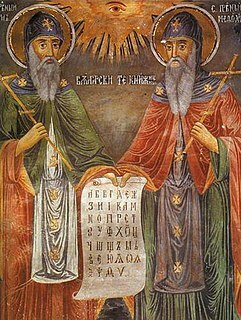 After the Christianization of Bulgaria in 864, Saint Clement of Ohrid and Saint Naum of Preslav were of great importance to the Orthodox faith and the Old Church Slavonic liturgy in the First Bulgarian Empire. The success of the conversion of the Bulgarians facilitated the conversion of East Slavic peoples, most notably the Rus', predecessors of Belarusians, Russians, and Ukrainians. Major event is the developement of the Cyrillic script in Bulgaria at the Preslav Literary School in the 9th century. The Cyrillic script and the liturgy in Old Church Slavonic, also called Old Bulgarian, were declared official in Bulgaria in 893. By the early 12th century, individual Slavic languages started to emerge, and the liturgical language was modified in pronunciation, grammar, vocabulary and orthography according to the local vernacular usage. These modified varieties or recensions (e.g. Serbian Church Slavonic, Russian Church Slavonic, Ukrainian Church Slavonic in Early Cyrillic script, Croatian Church Slavonic in Croatian angular Glagolitic and later in Latin script, Czech Church Slavonic, Slovak Church Slavonic in Latin script, Bulgarian Church Slavonic in Early Cyrillic and Bulgarian Glagolitic scripts, etc.) eventually stabilized and their regularized forms were used by the scribes to produce new translations of liturgical material from Koine Greek, or Latin in the case of Croatian Church Slavonic. Attestation of Church Slavonic traditions appear in Early Cyrillic and Glagolitic script. Glagolitic has nowadays fallen out of use, though both scripts were used from the earliest attested period. The first Church Slavonic printed book was the Missale Romanum Glagolitice (1483) in angular Glagolitic, followed shortly by five Cyrillic liturgical books printed in Kraków in 1491. Depending on regional uniqueness, various Church Slavonic recensions (redactions; Russian: извод, izvod) were used as a liturgical and literary language in all Orthodox countries north of the Mediterranean region during the Middle Ages, even in places where the local population was not Slavic (especially in Romania). In recent centuries, however, Church Slavonic was fully replaced by local languages in the non-Slavic countries. Even in some of the Slavic Orthodox countries, the modern national language is now used for liturgical purposes to a greater or lesser extent. parishes in the diaspora, including ones of Russian Orthodox Church Outside Russia often use local languages: English, French, Spanish, German, Dutch, Portuguese etc. The Church Slavonic language (also known as New Church Slavonic, the name proposed by F. V. Mareš) is actually a set of at least four different dialects (recensions), with essential distinctions between them in dictionary, spelling (even in writing systems), phonetics etc. The most widespread recension, Russian, has, in turn, several local sub-dialects with slightly different pronunciations. For the list and descriptions of extinct recensions, see article Old Church Slavonic language. The Russian recension of New Church Slavonic is the language of books since the second half of the 17th century. It generally uses traditional Cyrillic script (poluustav); however, certain texts (mostly prayers) can be printed in modern alphabets with the spelling adapted to rules of local languages (for example, in Russian/Ukrainian/Bulgarian/Serbian Cyrillic or in Hungarian/Slovak/Polish Latin). Before the eighteenth century, Church Slavonic was in wide use as a general literary language in Russia. Although it was never spoken per se outside church services, members of the priesthood, poets, and the educated tended to slip its expressions into their speech. During the seventeenth and eighteenth centuries, it was gradually replaced by the Russian language in secular literature and was retained for use only in church. Although as late as the 1760s, Lomonosov argued that Church Slavonic was the so-called "high style" of Russian, during the nineteenth century within Russia, this point of view declined. Elements of Church Slavonic style may have survived longest in speech among the Old Believers after the late-seventeenth century schism in the Russian Orthodox Church. Russian has borrowed many words from Church Slavonic. While both Russian and Church Slavonic are Slavic languages, some early Slavic sound combinations evolved differently in each branch. As a result, the borrowings into Russian are similar to native Russian words, but with South Slavic variances, e.g. (the first word in each pair is Russian, the second Church Slavonic): золото / злато (zoloto / zlato), город / град (gorod / grad), горячий / горящий (goryačiy / goryaščiy), рожать / рождать (rožat’ / roždat’). Since the Russian Romantic era and the corpus of work of the great Russian authors (from Gogol to Chekhov, Tolstoy, and Dostoevsky), the relationship between words in these pairs has become traditional. Where the abstract meaning has not commandeered the Church Slavonic word completely, the two words are often synonyms related to one another, much as Latin and native English words were related in the nineteenth century: one is archaic and characteristic of written high style, while the other is common and found in speech. Church Slavonic features okanye and yekanye, i.e., the absence of vowel reduction in unstressed syllables. That is, о and е in unstressed positions are always read as [o] and [jɛ]~[ʲɛ] respectively (like in northern Russian dialects), whereas in standard Russian pronunciation they have different allophones when unstressed. There should be no de-voicing of final consonants, although in practice there often is. The letter е [je] is never read as ё [jo]~[ʲo] (the letter ё does not exist in Church Slavonic writing at all). This is also reflected in borrowings from Church Slavonic into Russian: in the following pairs the first word is Church Slavonic in origin, and the second is purely Russian: небо / нёбо (nebo / nëbo), надежда / надёжный (nadežda / nadëžnyj). The letter Γ can traditionally be read as voiced fricative velar sound [ɣ] (just as in Southern Russian dialects); however, occlusive [ɡ] (as in standard Russian pronunciation) is also possible and has been considered acceptable since the beginning of the 20th century. When unvoiced, it becomes [x]; this has influenced the Russian pronunciation of Бог (Bog) as Boh [box]. The adjective endings -аго/-его/-ого/-яго are pronounced as written ([aɣo/ago], [ʲeɣo/ʲego], [oɣo/ogo], [ʲaɣo/ʲago]), whereas Russian -его/-ого are pronounced with [v] instead of [ɣ] (and with the reduction of unstressed vowels). In Serbia, Church Slavonic is generally pronounced according to the Russian model. The medieval Serbian recension of Church Slavonic was gradually replaced by the Russian recension since the early eighteenth century. The differences from the Russian variant are limited to the lack of certain sounds in Serbian phonetics (there are no sounds corresponding to letters ы and щ, and in certain cases the palatalization is impossible to observe, e.g. ть is pronounced as т etc.). The main difference between Russian and (Western) Ukrainian variants of Church Slavonic lies in the pronunciation of the letter yat (ѣ). The Russian pronunciation is the same as е [je]~[ʲe] whereas the Ukrainian is the same as и [i]. Greek Catholic variants of Church Slavonic books printed in variants of the Latin alphabet (a method used in Austro-Hungary and Czechoslovakia) just contain the letter "i" for yat. Other distinctions reflect differences between palatalization rules of Ukrainian and Russian (for example, ⟨ч⟩ is always "soft" (palatalized) in Russian pronunciation and "hard" in Ukrainian one), different pronunciation of letters ⟨г⟩ and ⟨щ⟩, etc. treating digraph ⟨оу⟩ as a single character rather than two letters (for example, in letter-spacing or in combination with diacritical marks: in Russian editions, they are placed above ⟨у⟩, not between ⟨о⟩ and ⟨у⟩; also, when the first letter of a word is printed in different color, it is applied to ⟨о⟩ in Russian editions and to the entire ⟨оу⟩ in Serbian and Ukrainian). hyphenation with no hyphenation sign. Rimskyj misal slověnskym jazykem izvoljenijem Apostolskym za Arcibiskupiju Olomuckuju iskusa dělja izdan. Olomouc 1972. Rimskyj misal povelěnijem svjataho vselenskaho senma Vatikanskaho druhaho obnovljen... Olomouc 1992. Although the various recensions of Church Slavonic differ in some points, they share the tendency of approximating the original Old Church Slavonic to the local Slavic vernacular. Inflection tends to follow the ancient patterns with few simplifications. All original six verbal tenses, seven nominal cases, and three numbers are intact in most frequently used traditional texts (but in the newly composed texts, authors avoid most archaic constructions and prefer variants that are closer to modern Russian syntax and are better understood by the Slavic-speaking people). In Russian recension, the fall of the yers is fully reflected, more or less to the Russian pattern, although the terminal ъ continues to be written. The yuses are often replaced or altered in usage to the sixteenth- or seventeenth-century Russian pattern. The yat continues to be applied with greater attention to the ancient etymology than it was in nineteenth-century Russian. The letters ksi, psi, omega, ot, and izhitsa are kept, as are the letter-based denotation of numerical values, the use of stress accents, and the abbreviations or titla for nomina sacra. The vocabulary and syntax, whether in scripture, liturgy, or church missives, are generally somewhat modernised in an attempt to increase comprehension. In particular, some of the ancient pronouns have been eliminated from the scripture (such as етеръ /jeter/ "a certain (person, etc.)" → нѣкій in the Russian recension). Many, but not all, occurrences of the imperfect tense have been replaced with the perfect. Miscellaneous other modernisations of classical formulae have taken place from time to time. For example, the opening of the Gospel of John, by tradition the first words written down by Saints Cyril and Methodius, (искони бѣаше слово) "In the beginning was the Word", were set as "искони бѣ слово" in the Ostrog Bible of Ivan Fedorov (1580/1581) and as въ началѣ бѣ слово in the Elizabethan Bible of 1751, still in use in the Russian Orthodox Church. ^ a b Hammarström, Harald; Forkel, Robert; Haspelmath, Martin, eds. (2017). "Church Slavic". Glottolog 3.0. Jena, Germany: Max Planck Institute for the Science of Human History. ^ See Brian P. Bennett, Religion and Language in Post-Soviet Russia Archived 2013-02-25 at the Wayback Machine (New York: Routledge, 2011). ^ See the report of Fr. Theodore Lyudogovsky and Deacon Maxim Plyakin, Liturgical languages of Slavic local churches: a current situation Archived 2012-09-03 at Archive.today, 2009 (in Russian), and a draft of the article Liturgical languages in Slavia Orthodoxa, 2009 (also in Russian) of the same authors. ^ "Rimski misal slavĕnskim jezikom". Kršćanska sadašnjost. Retrieved 2012-10-16. "German review of Rimski misal slavĕnskim jezikom". Slovo. Retrieved 2012-06-04. ^ "Review (in Croatian) of Rimskyj misal (Olomouc, 1972)". Slovo. Retrieved 2012-06-04. ^ "Review (in Croatian) of Rimskyj misal (Olomouc, 1992)". Slovo. Retrieved 2012-06-04. Herbermann, Charles, ed. (1913). "Slavonic Language and Liturgy" . Catholic Encyclopedia. New York: Robert Appleton Company. CyrAcademisator Transliteration tool for Church Slavonic including a virtual keyboard. The Cyrillic script is a writing system used for various alphabets across Eurasia, particularly in Eastern Europe, the Caucasus, Central Asia, and North Asia. It is based on the Early Cyrillic alphabet developed during the 9th century AD at the Preslav Literary School in the First Bulgarian Empire. It is the basis of alphabets used in various languages, especially those of Orthodox Slavic origin, and non-Slavic languages influenced by Russian. As of 2011, around 250 million people in Eurasia use it as the official alphabet for their national languages, with Russia accounting for about half of them. With the accession of Bulgaria to the European Union on 1 January 2007, Cyrillic became the third official script of the European Union, following Latin and Greek. The Glagolitic script is the oldest known Slavic alphabet. It is generally agreed to have been created in the 9th century by Saint Cyril, a Byzantine monk from Thessaloniki. He and his brother, Saint Methodius, were sent by the Byzantine Emperor Michael III in 863 to Great Moravia to spread Christianity among the West Slavs in the area. The brothers decided to translate liturgical books into the Old Slavic language that was understandable to the general population, but as the words of that language could not be easily written by using either the Greek or Latin alphabets, Cyril decided to invent a new script, Glagolitic, which he based on the local dialect of the Slavic tribes from the Byzantine theme of Thessalonica. A sacred language, "holy language" or liturgical language is any language that is cultivated and used primarily in religious service or for other religious reasons by people who speak another, primary language in their daily life. I is a letter used in almost all Cyrillic alphabets. The soft sign also known as the front yer or front er, is a letter of the Cyrillic script. In Old Church Slavonic, it represented a short front vowel. As with its companion, the back yer ⟨ъ⟩, the vowel phoneme that it designated was later partly dropped and partly merged with other vowels. Short I or Yot is a letter of the Cyrillic script. It is made of the Cyrillic letter И with a breve. Dze (Ѕ ѕ) is a letter of the Cyrillic script, used in the Macedonian language to represent the voiced alveolar affricate, pronounced like ⟨ds⟩ in the English word "pods". It is derived from the letter dzelo or zelo of the Early Cyrillic alphabet, and it was used historically for Old Church Slavonic, Ukrainian, Russian, and Romanian. Ukrainian Ye is a character of the Cyrillic script. It is a separate letter in the Ukrainian alphabet, the Pannonian Rusyn alphabet, and both the Carpathian Rusyn alphabets; in all of these, it comes directly after Е. In modern Church Slavonic, it is considered a variant form of Ye (Е е). Until the mid-19th century, Є/є was also used in Serbian. Other modern Slavonic languages may use Є/є shapes instead of Е/е for decorative purposes. Then, the letter is usually referred to by the older name Yest and the descriptive names Long E or Anchor E.
I with grave is a character representing a stressed variant of the regular letter ⟨И⟩ in some Cyrillic alphabets, but none includes it as a separate letter. Numerous Cyrillic alphabets are based on the Cyrillic script. The early Cyrillic alphabet was developed in the First Bulgarian Empire during the 9th century AD at the Preslav Literary School by Saint Clement of Ohrid and Saint Naum and replaced the earlier Glagolitic script developed by the Byzantine theologians Cyril and Methodius. It is the basis of alphabets used in various languages, past and present, in parts of Southeastern Europe and Northern Eurasia, especially those of Slavic origin, and non-Slavic languages influenced by Russian. As of 2011, around 252 million people in Eurasia use it as the official alphabet for their national languages. About half of them are in Russia. Cyrillic is one of the most-used writing systems in the world.